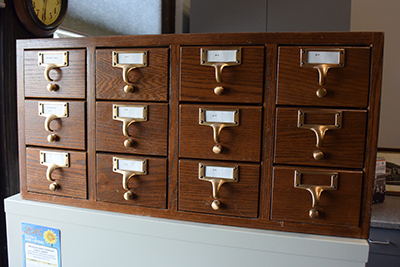 All Heller card files are furnished with solid wood drawer fronts and molded plastic drawers (wood drawers available upon request). Go down the page for picture of drawer and drawer pull. 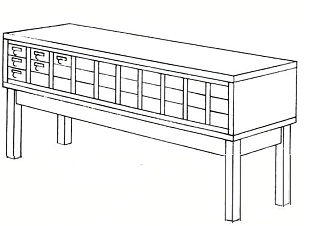 Any combination of units can be made with the use of the 5-drawer, 10-drawer and 15-drawer units. 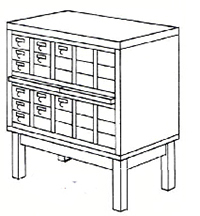 We recommend the 16" leg base with the units using more than 25 drawers. Style your own unit configuration to fit your needs. 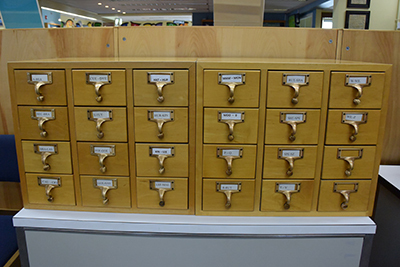 Heller rugged, reinforced drawers have 3/4'' solid wood fronts and provide long life. Metal follower holds cards in position. No. LF-12-12 Drawer Unit -(Not shown), 3 drawers wide, 4 drawers high. 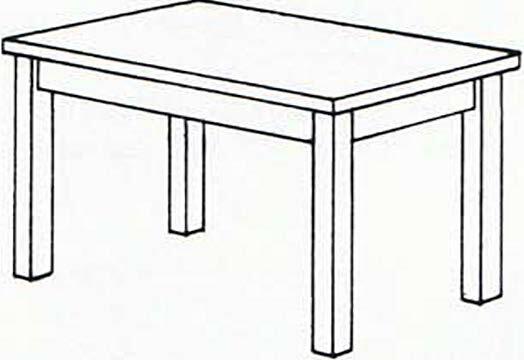 See page 8 for leg base for No's. LF-9 and LF-12. No. 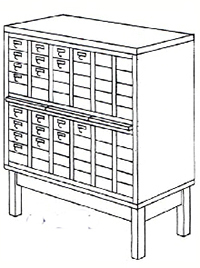 CF-40S-CARD FILE--40 drawer unit with solid closed base. No. 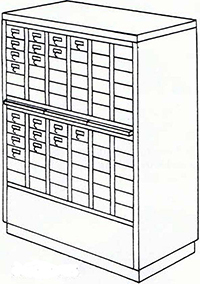 CF-40L-CARD FILE--40 drawer unit (not shown) same as above but with leg base. No. 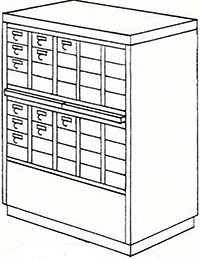 CF-72S-CARD FILE-72 drawer with solid closed base No CF-72L-CARD FILE-72 drawer unit (not shown) same as above but with leg base. 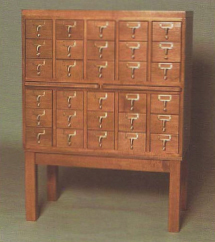 CF-310 - RANCH STYLE CARD FILE - 30 drawer, one piece I 1\4" high top, 18" deep. 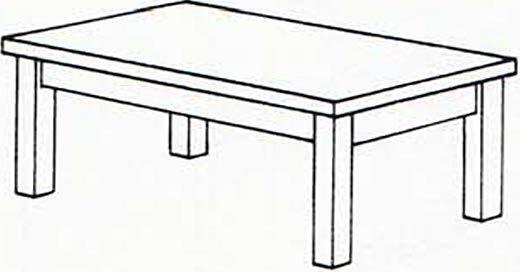 J 3Yi'' high, 66 3/8" long, leg base 26" high - Total height - 40 3/4"
No. LF-26 Leg Base 26 1/2" high same style as No. LF-58 but size for o. LF-9 or o. LF-12 Card Files - 20 1/2" W x 26 1/2" H x 18" D (not shown).